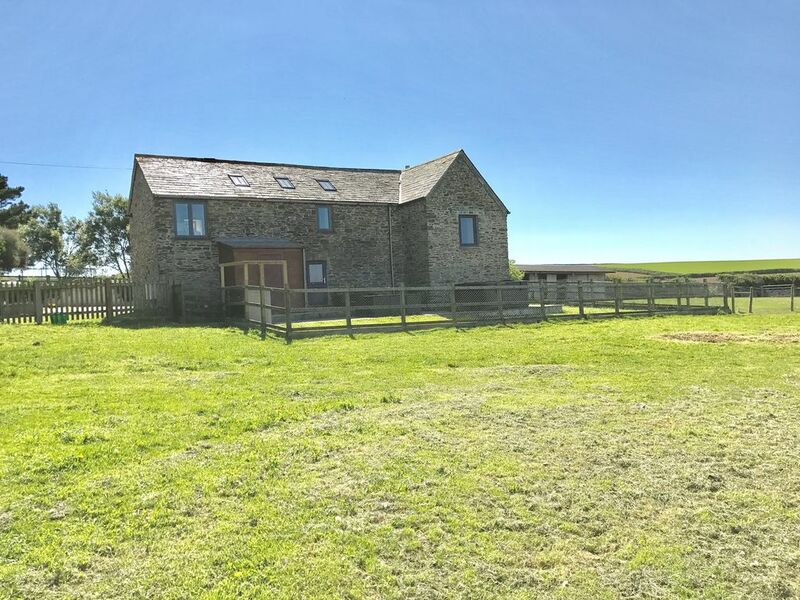 Beautiful 16th century holiday barn close to the local beach of Mawgan Porth with private hot-tub and surrounded by breathtaking views of the countryside, you truly have the best of both worlds. The barn offers luxury accommodation and all the comforts, mod-cons and entertainment you could require and more. Dog and young children friendly with secure private garden area. Fields available for dog walking and picnics. The barn is situated on a peaceful farm offering children small animal experiences. The barn is situated perfectly for exploring north Cornwall coast, short driving distance to Padstow, Wadebridge and Newquay. The local award-winning quaint village of St Mawgan offers beautiful walks and village amenities. Flat screed In all bedrooms and living room plus PlayStation and Nintendo consoles. An immaculately clean and comfy place with everything you could need for a great family holiday. The house is very nicely laid out with plenty of space for everyone, the garden is a gorgeous spot to chill out in, and the hot tub is just the icing on the cake! Also with the garden being fully enclosed, it’s perfect for dog owners. The location is fantastic for exploring the west coast of Cornwall and Clare is very welcoming, friendly and helpful. Thank you!! Wow! This place is a perfect family destination but would be ideal for a group of friends. It is tucked away in the countryside so you can feel the peace but not too far to Mawgan Porth. The house is kitted our with everything you need including cleaning products, coffee and tea etc. The kitchen has more than everything you need, with coffee machine and capsules provided. We are in every night as the setting and eating area is so lovely. Sheets are crisp white and big white fluffy towels. There are robes for the hot tub which was the icing on the cake. Sitting in the garden at the end of the day, in the tub, made the holiday. The area is lovely; Mawgan Porth is trendy and buzzing with a beautiful expansive beach but the coastline is littered with beautiful beaches. This is a perfect Cornish destination. Finally, Clare is amazing and so helpful. She made us feel looked after, welcome and dealt with any needs immediately. We will definitely be returning to this little paradise!! The Barn is warm and well equipped. It is very clean the kitchen has everything you need dishwasher, washing machine, fully fitted kitchen. A log burner TV PS3 and Wii it has a selection of games and dvds also board games etc. The bedrooms are beautiful on suite with the master. The owner has thought off everything from highchair to dressing gowns bath towels. There was milk and tea coffee put there for our arrival. The outside space is spectacular with a large beautiful outdoor hot tub which lit up at night with changing colour lights. A BBQ and lovely outdoor furniture. Fresh Eggs from the farm chicks 2 lovely donkeys 2horses and some lambs and mum sheep animals are friendly and great with children. The owner is lovely and helpful nothing was to much for them. The Barn is the most magical place to stay I will recommend it to anyone.